K.E. 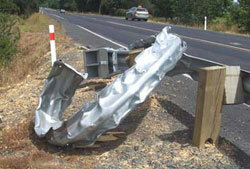 = 1/2 MV2 – RSI - Road Systems, Inc. 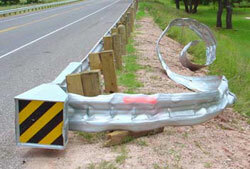 There are several models of roadside W-Beam terminals available today, and they are distinguished by various features. One of the most important, fundamental distinctions to be made between them is whether they are energy-absorbing or non-energy-absorbing. Although both performances are acceptable within the criteria of MASH or NCHRP 350, often times site conditions establish that energy-absorbing terminals, such as our FLEAT, are superior to non-energy-absorbing terminals because of the proximity of the end terminal to the hazard. Performance truly makes the difference here, and the characteristics of energy-absorbing terminals are proven to outperform their non-energy-absorbing couterparts. Conditions at the installation site are the determining factor on which type of terminal is most appropriate. Designers who call for these terminals MUST be made aware of these impact performance differences. Memo titled Supplementary Guidelines for the Selection of W-Beam Terminals. This gives the directions that all 50 States should be following. By answering the questions on this simple flow chart, officials specifying W-Beam terminals can easily determine whether energy-absorbing or non-energy-absorbing terminals are the best choice for a given installation.